Greenham Common is a World War II-era airfield roughly 30 miles west of London, but on Wednesday night it was the center of the nerdiverse. 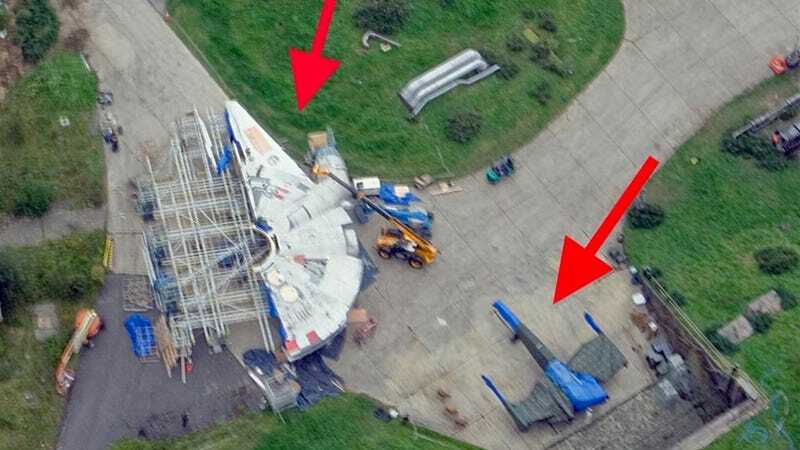 A local pilot flew over the area and snapped a photo of a half-built Millennium Falcon and an X-Wing fighter for the upcoming Star Wars Episode VII. The flight school instructor named Matthew Myatt posted the pic to Twitter, where it has been retweeted nearly 1,500 times and has made the rounds on several websites. Myatt said he didn't know it was there. He just happened to by flying over the old base, where some cruise missile silos were formerly located and was shooting promotional photos for the flight school. This should definitely get some good publicity for the school. Directed by J.J. Abrams, Star Wars: Episode VII is expected out in December of 2015. Many of its original cast are expected to return, including Harrison Ford as Han Solo, Carrier Fisher as Princess Leia, and Mark Hamill as Luke Skywalker.